CCTV Camera World now carries the latest 4K IP cameras that provide Ultra HD resolution of 3840x2160 pixels. 4K resolutions are available in cameras using 8MP and 12MP CMOS image sensors and require specific network video recorders like these 4K NVR recorders with high bit rate encoding capabilities. It is important to note that roughly 10 to 15 Mbps of bandwidth is required for a single 4K IP camera recording at 7fps at mid to low compression to yield acceptable video quality without significant compression artifacts. New for 2016 is the introduction of 4K security cameras with video streaming at 15fps which requires about 15 to 20 Mbps of encoding bandwidth. Hopefully in 2017 we will see product rollout with real time recording capabilities at 4K. All the 4K cameras we carry have robust Smart Detection capabilities as well which we will explore in the coming weeks. 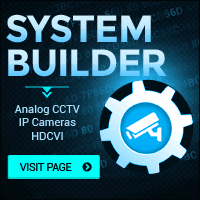 Below you will find our 4K camera reviews and more information about why choose 4K surveillance cameras. July 20, 2015 by Matthew Rossi. Ultra HD surveillance cameras are offered in three designs at this time. With all being IP66 or higher rated, they are all weather proof and can be used outdoor or indoors. There is a bullet and dome camera with 8MP CMOS sensor, and 66ft of infrared night vision. We also have a 360 degree fisheye dome camera that has a 12MP CMOS sensor, 32 ft night vision, and is IK10 vandal resistant. As is the case for all of our cameras, they contain advanced chip sets that allow for bandwidth control, image optimization with features such as DWDR, BLC, HLC, and digital noise reduction (DNR), allow of which allow you to optimize video in order to achieve your desired needs. May 3, 2015 by Don Stephens.